We’d love your help. Let us know what’s wrong with this preview of The Eyes of the Skin by Juhani Pallasmaa. Since the book's first publication, interest in the role of the body and the senses has been emerging in both architectural philosophy and teaching. This new, revised and extended edition of this seminal work will not only inspire architects and students to design more holistic architecture, but will enrich the general reader's perception of the world around them. The Eyes Since the book's first publication, interest in the role of the body and the senses has been emerging in both architectural philosophy and teaching. This new, revised and extended edition of this seminal work will not only inspire architects and students to design more holistic architecture, but will enrich the general reader's perception of the world around them. To ask other readers questions about The Eyes of the Skin, please sign up. "Please don't lick the art." Sign at the Minneapolis Institute of the Arts. There is no such sign on the IDS building or Crystal Court inside. Some art you want to consume, other art makes you want to run the other direction. This book helps you understand why. This book explores a lot of stuff we take for granted. Or more usually, ignore. In contemporary society, vision is our primary sense. It is also probably our most impersonal sense. You are reading this with your eyes. Before we were literate, I would have been telling you this. We spend a lot of time looking at pages, absorbing information on a two-dimensional scale. Many contemporary buildings are designed from the point of view of how they will look on a printed page, not how they will feel when you walk in. Cities are designed as a two-dimensional grid, with efficiency of transport, not pleasure in being transported, as the goal. With few exceptions, natural beauty is obliterated as an obstacle. Vision is instant. Television has displaced print as our primary information and entertainment media. I am constantly amazed at the speed of the images on the screen. I'll bet 100 images a minute is not unusual in television production. Our other senses are not so kaleidoscopic. Touch, smell, and taste are slow and sensuous. The book is full of such insights (reminders?). Our relationship to architecture is so important and yet so mindless. This book helps bring us back to appreciation of our constructed environment. Everyone loves this book. Well, at least all the architects I know. But then my only 'friends' seem to all be designers, so not that much diversity of opinion there. Not that I don't try, but people tend to not respond well to 3am 'Maxwell just crashed at 17% The end is nigh!!!' texts. I guess I should address my Goodreader friends as well. We're friends right? Ok, so there isn't much I can say that hasn't been said or better yet, practiced by the likes of Zumthor and Holl. But, as if I actually Everyone loves this book. Well, at least all the architects I know. But then my only 'friends' seem to all be designers, so not that much diversity of opinion there. Not that I don't try, but people tend to not respond well to 3am 'Maxwell just crashed at 17% The end is nigh!!!' texts. I'm quite reserve about the computer bit (in fact, most of his writings on technology). There seems to be a misunderstanding of computer imaging as a purely evil Cartesian flattening of our souls, but digital representation can also be considered in non-visual terms or serves as a transformation of bodily boundary. As for the distance between the object/subject in a virtual dimension - well, I would like to cite Grosz in saying the body and its environment are mutually defining blah blah. Wow, I sound pretty cynical here, maybe because I've met the guy and his speech was rather redundant. Anyway, great book, highly recommended for quotes and references with that essay you've been putting off for weeks. Also highly recommended for optometrists. Glasses are so overpriced. O prostoru, čulima i interakciji. Zaključak je da je osnova dobre arhitekture saodnos. Palasma ubedljivo i bez mistifikacije govori o jednom celovitijem, humanijem doživljaju prostora. A sva čula potiču od dodira. Dok se ostala čula tiču distance, dodir neposredno situira nas u odnosu na naše iskustvo okoline. (Nedovoljnost vida možda je i najupečatljivije prikazana u čuvenoj Karavađevoj slici sa naslovne strane.) Na samom početku knjige navodi se (doduše, bez daljnih objašnjenja, ali sa referencom - James Turrel, 'Plato's Cave and Light within' in: Elephant and Butterfly: permanence and change in architecture) kako naša koža može da razlikuje boje. Dakle, bukvalno i vidimo kožom. Na tom talasu, bilo bi jako zanimljivo načiniti i kakvu poetiku dodira (haptiku!) književnosti. A i sam Palasma ukazuje na to koliko je vizija grada Itala Kalvina i Dostojevskog uticala i na naš doživljaj prostora, ili kako su mirisi imali bitnu ulogu kod Rilkea i Prusta. kerap sekali kita ketemu atau kecebur dalam suatu pengalaman di dalam ruang yang memesona, menakjubkan, menggetarkan. dan ketika ruang yang hebat itu kita potret, menguaplah segenap kehebatannya. itu pengalaman saya dengan karya-karya yb. mangunwijaya yang kebanyakan hanya nikmat ketika 'DIHADIRI' atau didatangi, jangan melihatnya dari potret. buku ini menerangi gejala di atas: bahwa arsitektur itu bukan 'graphic games' bukan gambar yang dibikin meruang, tapi adalah suatu gubahan ruang yang bisa disentuh, diraba, dijelajahi dengan segenap indera kita. rabaan adalah induk dari segala indera. A beautiful book and inspirational. Pallasmaa is a remarkable writer and each sentence is evocative and can be the springboard for further analysis and thought. The short book investigates how the senses are activated in and through architecture and the built environment. Logging the ocularcentric nature of most architecture theory, Pallasmaa evokes sound (and silence), but also scent and texture in a profoundly moving and effective way. Most significantly, there is attention to memory, passion a A beautiful book and inspirational. Pallasmaa is a remarkable writer and each sentence is evocative and can be the springboard for further analysis and thought. This is my first architectural read which purely deals with philosophy. And I am pretty sure I will re-read this book soon. "The narcissistic eye views architecture solely as a means of self-expression, and as an intellectual-artistic game detached from essential mental and societal connections [...] disengag[ing] the body, and instead of attempting to reconstruct cultural order, it makes a reading of collective signification impossible." Pallasmaa goes on to say this this is a result of the essentially "detaching sense of vision", and that this nihilistic attitude would be impossible to imagine in a sense of touch. I just don't understand this. I think that an architectural project which seeks to either control by atomizing its inhabitants or merely flatter the self-expression of the architect will result in an isolation of ALL the senses. Surely our visual culture also suffers as a result. Truly, the real danger is a reification of categories. In a society of mass produced space the entire cocktail of senses are reinforced and predictable. How is the visual significantly different? The search for instantaneity and immediate impact has withered all of our senses—but more importantly, it has reified categories of thinking which serve to quell the furnaces of imagination. One of the most startlingly perceptive books I've ever read. The haptic world as experienced within the completely overlooked, misunderstood (and utterly relevant) boundaries of peripheral vision. Pallasmaa writes so articulately, the expression 'masterpiece' is, for once, entirely deserved. One that leaves my jaw wide open every time I go back to it, which is often, because the beauty and skilfulness in his observations and philosophy staggers me. Pallasmaa seems to find exactly the right balan One of the most startlingly perceptive books I've ever read. The haptic world as experienced within the completely overlooked, misunderstood (and utterly relevant) boundaries of peripheral vision. Pallasmaa writes so articulately, the expression 'masterpiece' is, for once, entirely deserved. One that leaves my jaw wide open every time I go back to it, which is often, because the beauty and skilfulness in his observations and philosophy staggers me. Pallasmaa seems to find exactly the right balance -- he tends to sway towards a nostalgia, a hankering after the way things once were, but he never loses his grip on the 'now', providing the solutions to counter the mind-numbing, dumbing-down of the senses that today's plethora of mediocre architecture inflicts upon us -- built for the masses and enjoyed by none. The Eyes of the Skin is the antidote to that unexplainable malaise, brought about by time spent in shopping centres, hotels, leisure centres, airports, hospitals, etc, etc. It's positively brimming with optimism for new ways of experiencing and defining our civic buildings, and the built world as a whole. Beautifully written book! Starting from the vision hegemony dominating western culture since Classical Greece and the Cartesian abdication of the remaining senses projecting onto our ways of experiencing and understanding of the cosmos, Pallasmaa discusses the impact on space production and architecture. In his second part he goes on to describe architecture as a multisensory, rather than a simply ocular experience, and talks of the subjective ways and other senses beyond the 5 known ones it is Beautifully written book! Starting from the vision hegemony dominating western culture since Classical Greece and the Cartesian abdication of the remaining senses projecting onto our ways of experiencing and understanding of the cosmos, Pallasmaa discusses the impact on space production and architecture. In his second part he goes on to describe architecture as a multisensory, rather than a simply ocular experience, and talks of the subjective ways and other senses beyond the 5 known ones it is perceived. In just very few pages Pallasmaa elaborates on issues of phenomenology difficult to be expressed. Pallasmaa's writing is unquestionably fascination, thought-provoking, and poetically beautiful. He writes with care and passion about our built environment, and it sticks enough that you wind up contemplating the ramifications of his ideas as wander through the spaces of your day-to-day life. 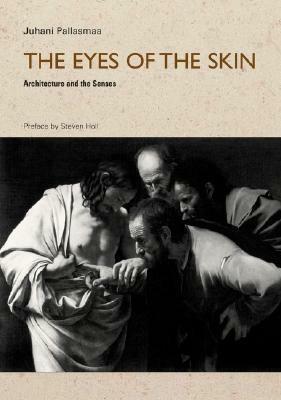 And at the same time, a book like The Eyes of the Skin proves how intellectually limp so much phenomenology is. Pallasmaa's writing is gorgeous, provocative, contemplative, and completely lacking in rigor. T Pallasmaa's writing is unquestionably fascination, thought-provoking, and poetically beautiful. He writes with care and passion about our built environment, and it sticks enough that you wind up contemplating the ramifications of his ideas as wander through the spaces of your day-to-day life. In such a small amount of pages there's so much from ocularcentrism and the loss of senses to Pallaasma's take on arquitecture. It embraces an interesting philosophy way beyond my expectations. Bastante recomendável mesmo para aqueles que não têm um contacto direto com as Artes (embora seja impossível encontrar alguém que não esteja familiarizado com os seus diversos ramos!). Juhani Pallasmaa es un arquitecto, profesor y escritor finlandés (n. 14 de septiembre de 1936, Hämeenlinna, Finlandia). Adicional a lo anterior, ha fungido como Director del Museo de Arquitectura Finlandesa (1978-1983) y como presidente del Instituto de Artes Industriales en Helsinki. Pallasmaa se dedica al campo de la arquitectura y la filosofía de la arquitectura, especialmente en temas de la funcionalidad de las obras arquitectónicas. Ha escrito textos como Questions of perception: phenomenol Juhani Pallasmaa es un arquitecto, profesor y escritor finlandés (n. 14 de septiembre de 1936, Hämeenlinna, Finlandia). Adicional a lo anterior, ha fungido como Director del Museo de Arquitectura Finlandesa (1978-1983) y como presidente del Instituto de Artes Industriales en Helsinki. Pallasmaa se dedica al campo de la arquitectura y la filosofía de la arquitectura, especialmente en temas de la funcionalidad de las obras arquitectónicas. Ha escrito textos como Questions of perception: phenomenology of architecture (1993), La arquitectura y los sentidos (1996) y Archipelago: Essays on Architecture (2006). Sin embargo, en el presente texto me centraré en el texto Los ojos de la piel (2006), por las razones que se expondrán a continuación. había preocupado cada vez más por cómo el predominio de la vista, y la supresión del resto de los sentidos, había influido en la forma de pensar, enseñar y hacer crítica de la arquitectura, y por cómo, consecuentemente, las cualidades sensuales y sensoriales habían desaparecido de las artes y de la arquitectura. (Pallasmaa, 2006, p. 9). Así, es evidente que el autor se preocupa por la predominancia que ha obtenido el sentido de la visión para la comprensión y percepción del mundo, y especialmente de la arquitectura, dejando de lado los demás sentidos como el oído y el tacto. Teniendo en cuenta lo anterior, la presente reseña tiene como objetivo exponer los argumentos que Pallasmaa menciona en Los ojos de la piel (2006), así como también lo es exponer mi opinión personal acerca de los mismos. Para lograr lo propuesto, en primer lugar expondré brevemente los argumentos que Pallasmaa trata en el texto anteriormente referido. Luego, mencionaré mi opinión acerca de ellos para, al final, presentar las conclusiones. 1. Una crítica al ocularcentrismo. En las últimas décadas, la vista ha ocupado el tope de la pirámide sensorial. Lo anterior debido a que, desde que se implementó la escritura como medio de transmisión de información, la pirámide sensorial se volcó, dándole paso a la visión como sentido ‘primordial’ y dejando relegados otros sentidos como la oralidad y el tacto. (Pallasmaa, 2006, p. 24). Esto significa que desde hace varios milenios, cuando el ser humano sintió la necesidad de consagrar la información considerada importante, y especialmente aquella que necesitaba ser trasmitida de manera intacta e incólume, por medio de la escritura, hubo un cambio paradigmático en cómo los seres humanos percibíamos el mundo a nuestro alrededor. Así, al tener que ver para leer, pasamos de la conocida ‘tradición oral’, basada en el habla y en el oído, a una percepción más visual del mundo. Este predominio del ojo, acompañado del surgimiento de imágenes en velocidades nunca antes vistas, ha desencadenado un distanciamiento y un aislamiento masivos entre los seres humanos y el mundo que nos rodea. Este cambio en la pirámide sensorial ha causado que dejemos relegados a los demás sentidos que, según el autor, nos acercan más al mundo que la visión. Dice Pallasmaa que “la vista nos separa del mundo, mientras que el resto de los sentidos nos une a él”. (2006, p.25). Debido a lo anteriormente expuesto, los arquitectos de las últimas décadas se han centrado en producir obras que sean placenteras para el ojo; pero dejadas de significado y estímulo para los demás sentidos. Expone el autor que “La inhumanidad de la arquitectura y la ciudad contemporáneas puede entenderse como consecuencia de una negligencia del cuerpo y de la mente, así como un desequilibrio de nuestro sistema sensorial.” (Pallasmaa, 2006, p. 18). Esto evidencia la opinión que le merece al autor el cambio en la pirámide sensorial y el impacto que esto ha tenido sobre la arquitectura. 2. La vida como experiencia multisensorial, y especialmente, táctil. Expone Pallasmaa que todos los sentidos son una especie de tacto, ya sea consciente, como el tacto mismo, o inconsciente, como la visión y el oír, ya que, al fin y al cabo, son especializaciones de la piel en distintas partes del cuerpo. Dice, textualmente: “El ojo quiere colaborar con el resto de sentidos. Todos los sentidos, incluido la vista, pueden considerarse como extensiones del sentido del tacto, como especializaciones de la piel.” (Pallasmaa, 2006, p. 43). No obstante lo anterior, el sentido de la visión necesita de los otros sentidos para lograr obtener una comprensión integral de aquello que nos rodea, mientras que los demás sentidos pueden darnos tal comprensión sin la necesidad de la vista. Citando a George Berkeley, el autor pone como ejemplo que el sentido de la vista necesita del sentido del tacto para proporcionarle sensaciones de profundidad, solidez, distancia, que sólo con ver no se logran obtener totalmente. Entonces, expone Pallasmaa, que solo al hacer un uso simultáneo de los 5 sentidos se logra una comprensión integral del mundo que nos rodea y, así, de la vida y de la experiencia humana. Es mediante el uso de todos los sentidos que obtenemos una sensación de aquello que nos rodea lo suficientemente precisa como para entender el mundo totalmente. 3. Una arquitectura que responda a los sentidos. Como conclusión del texto, el autor arguye que la arquitectura debe ser entendida como un arte, y en ese sentido, no solo debe estimular el sentido de la visión sino que también los otros sentidos, como logran algunos artistas mediante sus obras de arte. Bajo ese entendido, deben incorporarse en los edificios experiencias táctiles y sonoras que evoquen memorias en los observadores. Expone Pallasmaa que los edificios y ciudades nos permiten ubicarnos en el espacio y tiempo que comprende el mundo, para sí comprender nuestro rol en él. Al visitar edificios, lugares, o habitar en ellos, éstos pasan a ser parte de nuestros cuerpos, es decir, de nosotros mismos. Entonces, para lograr una comprensión multisensorial del mundo, que a su vez, implica una comprensión integral de este, los edificios que se creen de ahora en adelante deben ser íntegros, en el sentido de que deben estimular no solo un sentido sino, en lo posible, todos. 4. Opinión personal y conclusiones. In this rather slim, easy-to-read volume, Pallasmaa makes a convincing case for architecture and space as more than just visual treat, but as something that is inevitably, inherently lived in, experienced with the whole body of the person inhabiting such spaces. This seems somewhat obvious when one reads it, and yet it is easy to see how this gets lost in ideas of visual appeal for physical spaces. Again and again Pallasmaa returns to the form and function of space as assisting in providing meta In this rather slim, easy-to-read volume, Pallasmaa makes a convincing case for architecture and space as more than just visual treat, but as something that is inevitably, inherently lived in, experienced with the whole body of the person inhabiting such spaces. This seems somewhat obvious when one reads it, and yet it is easy to see how this gets lost in ideas of visual appeal for physical spaces. Again and again Pallasmaa returns to the form and function of space as assisting in providing metaphors and guiding principles for how human beings live their lives. This is not a straightforward relationship, mind you, but one of back-and-forth understanding, in which life influences space and space influences life. "I like to see how far architecture can pursue function and then, after the pursuit has been made, to see how far architecture can be removed from function. The significance of architecture is found in the distance between it and function"
I think Ando will be a better author to this book. Apart from his bizarre marble-licking action to make a case for architecture and oral sensations, I think it is rather insensitive of him praising Villa Savoye - good in the eyes but bad for inhabitants' lung. It does have a few inspiring words so it wouldn't hurt to read, it is pretty short, only 62 pages. This book helpfully challenges the medusa like gze that petrifies our attention. The computer has perhaps drawn us away from the artists experience of his artistic vision through his body awareness. Te hegemoy of sight is forgetting the importance of "The Preconscious, perceptual realm, which is experienced outside the sphere of focused vision seems to be more important than the focused image". What of the realm space and collective behavior? For so long the art of story was the unifier of commun This book helpfully challenges the medusa like gze that petrifies our attention. The computer has perhaps drawn us away from the artists experience of his artistic vision through his body awareness. Te hegemoy of sight is forgetting the importance of "The Preconscious, perceptual realm, which is experienced outside the sphere of focused vision seems to be more important than the focused image". What of the realm space and collective behavior? For so long the art of story was the unifier of community. Un texto esencial para que los arquitectos podamos explicar (explicarnos) que hay vida más allá de la forma, más acá de la búsqueda del estilo. Un recurso para recordar por qué un día quise ser arquitecto. Una guía para un día quizá llegar a serlo. Very short book, but quite lovely. Transitions from some ocular centric critiques to discussing space and feeling. Quite good, I will need to make this book a priority again, as it makes a link clear for me in my own work... on space versus place. Thanks Pallasmaa! Zeer goed boek, ingewikkeld, maar heel diep. Insightful. I'm not a student of architecture but the points highlighted are clear amd distinct. It seems that it provided me a new perspective regarding art that is not entirely visual. Un maravilloso ensayo acerca de la arquitectura y los sentidos. Recomendado de leer no sólo para interesados en la arquitectura, sino para aquellos interesados en las artes en general. it's that kind of beautiful things which carry you far away and recalls all your senses experiences together all at once in a very easy format of words .. very recommended YOU NEED TO HAVE IT !! reading this book was a journey. i got distracted and lost a lot by the amount the author described small and simple details.. sometimes frustrating but overall i think it was a great book. Leitura rápida. Mostra como a percepção do corpo é fundamental na concepção dos espaços. Defende que boa parte da arquitetura é produzida priorizando a visão em detrimento dos outros sentidos.